Freight Activity Centers (FACs) are responsible for the vast majority of freight vehicle trip origins and destinations in the Tampa Bay region, transporting a diverse array of commodities using a variety of transportation modes. In 2012, a total of over 317 million tons of freight was estimated to originate, terminate, or circulate within the Tampa Metropolitan Statistical Area (MSA), which includes Hillsborough, Pinellas, Pasco, and Hernando Counties. 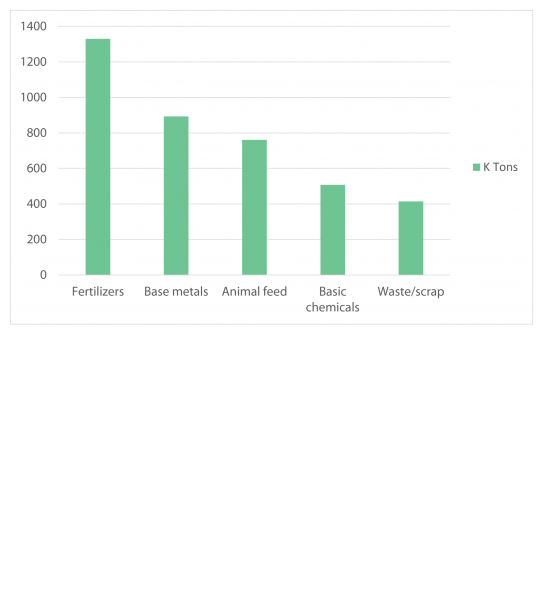 In that same year, inbound commodities accounted for 146 million tons, while outbound commodities destined for both domestic and international locations accounted for 109 million tons. Internal movements, defined as goods produced and consumed within the region, accounted for about 62 million tons in 2012. By 2040, the total goods moved into, out of and internally in the region is projected to climb to 413 million tons. Several principal commodities account for the majority of overall freight traffic in the Tampa Bay region. 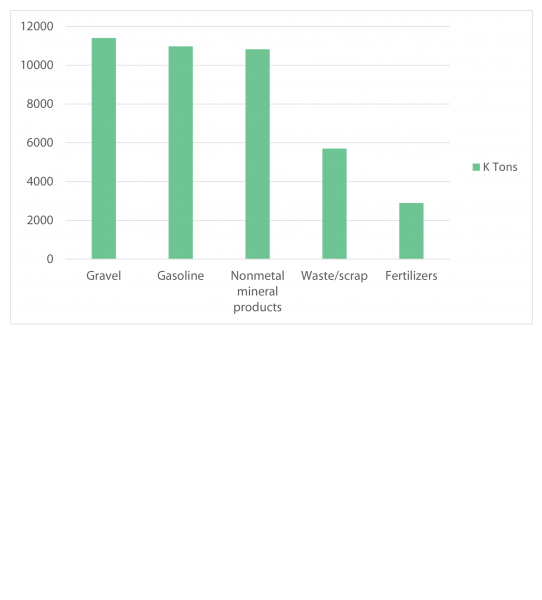 Gravel, primarily used for construction, accounted for over 14.5 percent of the Tampa MSA’s total freight tonnage in 2012. Nonmetal mineral products, including stone, crushed stone, concrete and other materials, also support the construction industry. 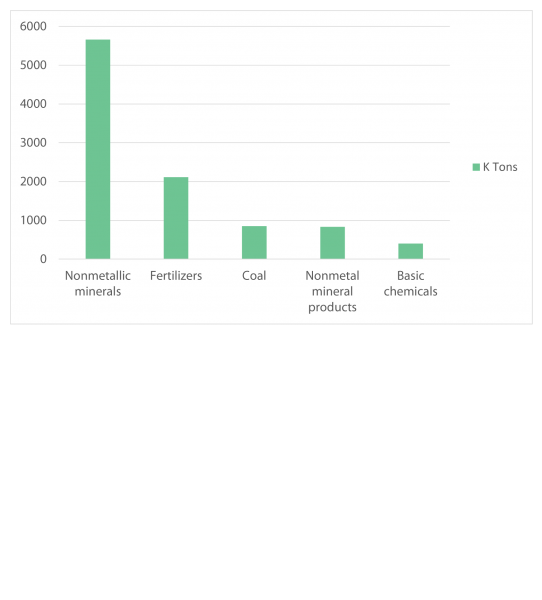 Gasoline for motor vehicles and aviation turbine fuel was the second largest commodity transported throughout the region. 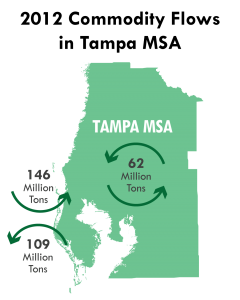 Fertilizers, which are primarily phosphate derived, move into the Tampa MSA from the Bone Valley area and are distributed across the country and the world from Tampa. In the Tampa Bay region, waste/ scrap refers primarily to scrap metals such as steel and aluminum that are shipped abroad for use in manufacturing processes. Together, these principal commodities represented more than 60 percent of freight tonnage moved through the Tampa MSA in 2012. These bulk commodities drive the economic activity at Port Tampa Bay and support numerous industries in the region. They are likely to remain the region’s primary cargoes for the foreseeable future. However, the anticipated growth in container traffic at Port Tampa Bay and Port Manatee will likely increase the tonnage of break bulk cargoes like manufactured goods, electronics, and furniture flowing through the region and generate additional truck traffic in the coming decades.